Appealing to today's more value-conscious upscale traveler, luxury line Crystal Cruises has added all-inclusive amenities to their standard pricing. 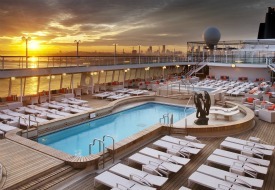 These new benefits began with Crystal Symphony's first transatlantic voyage from Miami to Lisbon on March 19 (the next all-inclusive sailing will be the Crystal Serenity's trip from New York to London on May 8). The new all-inclusive pricing includes prepaid gratuities for housekeeping, butler, and dining staff, an impressive selection of fine wine and premium spirits in the restaurants, open-bar service throughout the ship, 24-hour room service, and more. As repeat passengers, my husband and I anticipated exceptional cuisine and a world of imaginative itineraries when we had the pleasure of taking an 11-day cruise through the Panama Canal in January. It was the perfect time of the year to sail from Costa Rica into the turquoise waters of the Caribbean Sea, stopping at the colorful ports of Curacao, St. Maarten and St. Thomas before arriving in Miami. Unfortunately, it was too soon in the year for us to take advantage of Crystals all-inclusive pricing  but there's always a next time. With only 922 onboard guests, Crystal Symphony offers one of the highest staff-to-guest ratios at sea, with diverse and spacious accommodations in all categories. Since we were celebrating our anniversary, we opted for a mid-ship penthouse that included a complimentary butler, a verandah, a flat-screen TV, a walk-in closet, and a bathroom with a separate shower and Jacuzzi tub. But wait, it gets even better! Sebastian, our butler, arranged for our clothes to be pressed, delivered canapés to our room each afternoon, and stocked our bar with bottled water and soft drinks daily. No luxury hotel on land could have topped this six-star hospitality. Among the unique advantages of cruising with Crystal are the dining choices. In addition to the classic main or late seating in the Crystal Dining Room, we loved the flexibility of Open Dining by Reservation. This allowed us to reserve a table at a different time each night. Maitre d Mario Gallo personally welcomed us back and escorted us to our table for two. A bottle of Cabernet was the perfect complement to the wonderful presentation and diverse menu featuring chateaubriand served with duchesse potatoes and sea scallops paired with lemon cous cous. The ship's specialty restaurants were equally impressive. Famed master chef Nobu Matsuhisa brings his unique fusion of Japanese, Peruvian, and European-style cuisine to Silk Road & The Sushi Bar. Winning courses such as the miso black cod and yellowtail sashimi get star billing. An entirely different ambiance prevails at Prego, where the tastes of Italy come alive. The chefs signature osso bucco, a veal shank braised with wine sauce and seasoned stock, captures the essence of each ingredient. The generous portions and inviting desserts continued to please us each time we returned. For more casual fare, we opted for the breakfast buffet at The Lido Café, a poolside lunch at Trident Bar and Grill, specialty coffee at The Bistro, and afternoon tea in Palm Court. Its a rare treat to experience all of these unique dining opportunities on one ship  and even more remarkable to realize that no gratuity is expected on my next Crystal cruise thanks to the new pricing plan. Crystal Symphony hosts exceptional entertainment as well. We enjoyed performances ranging from classical piano recitals to elaborate Broadway-style shows. A talented ensemble of singers and dancers tipped their hats to the silver screen in The Envelope Please and tapped their feet to Curtain Call. For those who prefer to do the singing themselves, the Avenue Saloon keeps the evening going with a medley of favorite sing-along piano tunes. If our evenings were filled with entertainment, our days were filled with exploration on and off the ship. To stimulate learning experiences, guests can take a complimentary computer course, a Yamaha keyboard lesson, or a foreign language class. Crystals outstanding enrichment program features renowned speakers, authors, and destination experts. On our voyage, former New York City mayor Ed Koch explored current world affairs, retired FBI agent Clint Van Zandt spoke about several criminal investigations, and Crystals destination lecturer, Anthony Terry, presented several events leading up to the construction of the Panama Canal. Crystal provides their guests with excellent day excursions. During a Jewish Heritage Tour of Curacao, we explored a Jewish community that has been an important part of Curacaos history and culture, and as part of Crystals You Care. We Care program, we spoke with guests who volunteered to paint a day home for autistic boys. Other highlights of our Caribbean voyage included visiting a butterfly farm in St. Maarten and spending a day on Magens Bay beach in St. Thomas. On Crystal Cruises, its not just about the destination; its also about the journey at sea. Its no wonder we're looking for reasons to return on Crystal  and one of the biggest reasons is the new all-inclusive pricing, which promises to make the value-filled experience even more enticing. For more information and reservations, visit www.crystalcruises.com. And be sure to check out our new cruise hub for the latest cruise deals and trip-planning information.